The more than 400,000 Coloradans trying to make a living without a high school diploma will now have two more ways to reach that milestone and become more self-sufficient. This week, the Colorado Board of Education approved adding two alternatives to the GED test for people to receive an equivalency high school diploma. The change passed on a vote of 4-3 on Thursday. With the approval, Colorado becomes the sixth state to accept all three: the GED diploma, the High School Equivalency Test and the Test Assessing Secondary Completion. Three states, including New York, use only the TASC test; seven use only the HiSET; and two accept both the GED test and the HiSET. 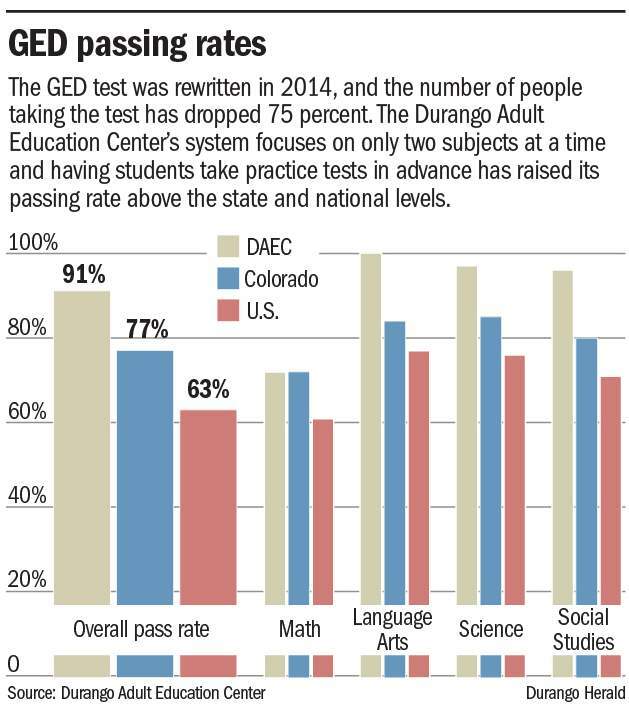 Since the GED battery of tests was rewritten in 2014 to align with Common Core standards, the number of Coloradans taking the GED test has dropped 75 percent. So few people are passing, Buchanan said, it will affect Colorado’s supply of skilled workers. Teresa Malone, executive director of the Durango Adult Education Center, said she isn’t sure what the change will mean for the center and its students. The HiSET, administered by the Educational Testing Service, says adult education centers can use the same curriculum and materials they’ve been using for GED preparation. TASC, created by McGraw-Hill Education and administered by Data Recognition Corp., would require purchasing new materials and redesigned curriculum. Both allow students to take the test either online or with pencil and paper, unlike the GED, which is strictly online. That might allow students who are not as computer savvy to pass at higher rates.